Last week it was all about the good news. This week, sadly, it's all about the bad. 2016 was filled with celebrity loss but losses that were very personal for me happened at the end of that year and the start of this one. The day before I went on book tour in December to promote Alien Nation, we found out that my father-in-law had stage 4 lung cancer, in his lung, throat, and spine. Prognosis wasn't good, but Dad was a fighter, and he made it into 2017. Someone else did not. One of my BFF's, author Terry Smith, got the call you don't want the day after our book signing in Henderson, NV. Her stepfather, Charles Stevens, had sat down to put on his shoes and died. While Chuck's health hadn't been great, no one, least of all Terry and her mom, expected him to go in this way. 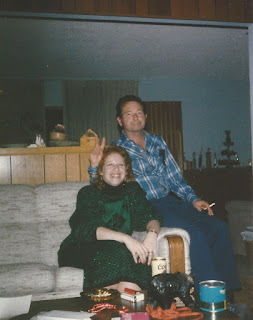 Chuck was an Army veteran, and he's survived by his wife, Patsy, and a large extended family who all miss him. If you would like to offer support, please donate to the Brain Trauma Organization in the name of Charles E. Stevens. 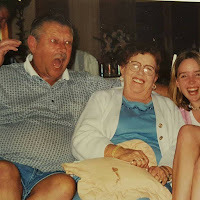 Dad was a wonderful person and he was my father just as much as he was my father-in-law. He was a veteran of the Army and also of the Hollywood studio system, where he was a legendary best boy and key grip. He was a Union man, a loyal friend, and, occasionally, a goofball. He was also a loving husband, father, father-in-law, and grandfather. He's survived by his wife of over 60 years, three sons who are all wonderful husbands, fathers, and members of society, three daughters-in-law who loved him for who he was and what he taught their husbands to be, and five grandchildren who are all either great young adults or wonderful little kids. If you would like to offer support, please donate to the St. Jude's Children's Hospital in the name of Douglas Vernon Cook. Someone else was also fighting cancer -- my good friend, author Alan Black. Alan and his wife, Duann, hadn't told a lot of people about his fight, but I was one who knew. I had nothing but confidence that Alan would beat cancer -- he was doing everything right and had the right mindset and all the support. And at our book signing in Henderson, NV, Alan was looking good, feeling confident, ready to write on for years to come. And yet, when Steve and I came home from Los Angeles and Dad's funeral, the call came -- Alan had lost his battle with cancer and had died on the 21st. 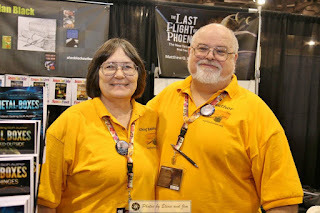 Alan was an Air Force veteran, an excellent author, a good friend, and a wonderful husband, and Duann is now carrying on his legacy as best she can for all the fans and friends who wish Alan was still right next to them, spinning tales. If you would like to offer support, please donate to Arizona Consortium for the Arts in the name of Alan Black. Be good to yourselves, be good to each other, and tell the people that you care about that you care about them. You never know when "see you at the next one", "see you when I get back" or "see you later" will be the last thing you ever say to someone. Be sure that the people you love know that you love them while they're still here to enjoy that knowledge. Peace out, my li'l gangstas, know that I love each and every one of you, and let's be loving each other readers out there.